Keep your computer, your identity, and your stuff safe with powerful, yet easy-to-use protection. Norton 360 combines our top-rated threat protection technology and automatic backup in one comprehensive PC solution. It?s more than just data. 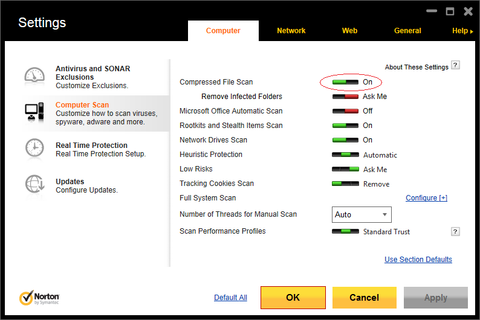 Norton 360's PC Tuneup boosts overall performance and keeps your computer running at its best. Automatic online or local backup helps keep your important files and photos safe from loss. Exclusive Insight technology blocks up to 100% of viruses and eliminates threats before they can reach your computer. It warns you of and blocks dangerous websites. Social Media Scanner warns you of unsafe websites and Facebook posts so you can share links without worrying about passing on or receiving threats. Prevent cybercriminals from stealing your identity and money when you surf, shop, socialize, and bank online. When it comes to your identity, your computer, and your files, you can never have too much protection. Norton 360 provides comprehensive, easy-to-use protection that defends against nearly any threat. Seamlessly combines our top-rated protection technology and automated backup into one easy-to-use solution for PCs. Browse, shop, bank, and socialize online without worry, annoying slowdowns, or disruptions. Over 20 intelligent sensors and superior performance mean your protection won?t get in your way. Secures and remembers user names and passwords to prevent cybercriminals from hacking into your PC and swiping your information. Help protect your kids from Internet dangers with award-winning Norton Online Family. Parental controls management lets you easily connect to Norton Online Family right from within your Norton Control Center. Tracks which websites and social networks your kids? visit, so you can spot potential dangers or block inappropriate sites. Protect your photos, music, videos, and other important stuff from loss with automatic online backup. Automatically backs up and encrypts your important files, so you can get them back in case of a hard drive crash, natural disaster, or other mishap. Online access lets you easily backup and share photos, videos, and other files with PCs, Macs, or even smartphones ? by simply emailing them a link. Fine-tunes your PC?s settings to keep it running at top speed. Frees up memory so applications start up and run faster.